Preheat oven to 325°F. In a roasting pan, place sliced lemons and pour water in the bottom of the pan. Place spiral ham cut-side down on the lemons and cover loosely with foil. Bake the ham for about 10 minutes per pound until it is just warmed through. Spiral ham is completely cooked already (so you can even serve it cold if you want). Meanwhile, combine glaze ingredients in a small saucepan and heat until ingredients are mixed. Let the glaze bubble and simmer for 5-10 minutes until the glaze starts to thicken. Then let it cool. When ham is done, uncover it and drizzle glaze over the top. Spiral hams are the tricksters of the holiday meal. They look intimidating because they can weigh 7 pounds and be bulky. But they are also incredibly easy to cook. The trick is to take the doctor’s approach. First rule of spiral hams: Do no harm. 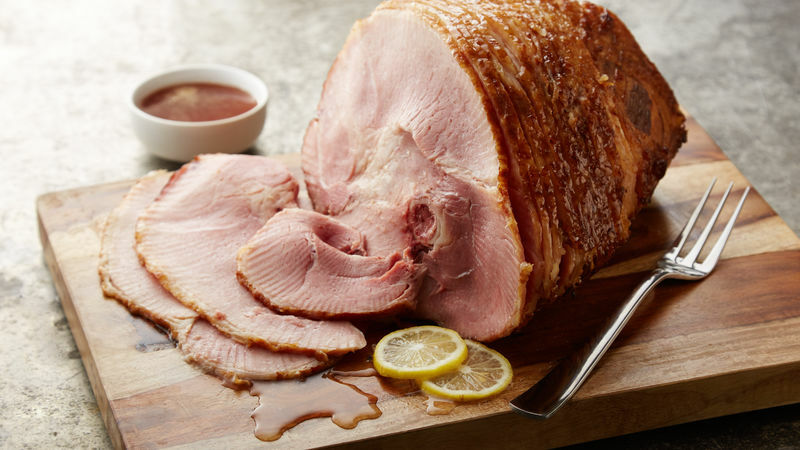 What you might not know about spiral ham is that you actually don’t need to cook them at all. They're completely cooked already, so you could literally just open the ham and serve it without touching it. But that’s not very fun, right? Also, cold ham is good in sandwiches but not for your holiday guests. So we can do better by cooking the ham, or more specifically, warming the ham. The danger: since the ham is already cooked, it's really easy to dry out. Spiral hams are the tricksters of the holiday meal. They look intimidating because they can weigh 7 pounds and be bulky. But they are also incredibly easy to cook. The trick is to take the doctor’s approach. First rule of spiral hams: Do no harm. What you might not know about spiral ham is that you actually don’t need to cook them at all. They're completely cooked already, so you could literally just open the ham and serve it without touching it. But that’s not very fun, right? Also, cold ham is good in sandwiches but not for your holiday guests. So we can do better by cooking the ham, or more specifically, warming the ham. The danger: since the ham is already cooked, it's really easy to dry out.